Permission to include excerpts of Mentor Author, Mentor Texts by Ralph Fletcher (Heinemann, 2011) was granted by the publisher. I was recently offered a position as an adjunct professor starting in 2012. I will be teaching a graduate course about using children’s literature to teach writing. As I prepare to teach this course, one of the things I have to think about are the professional texts I will require my students to read, as well as ones to put on the suggested reading list. 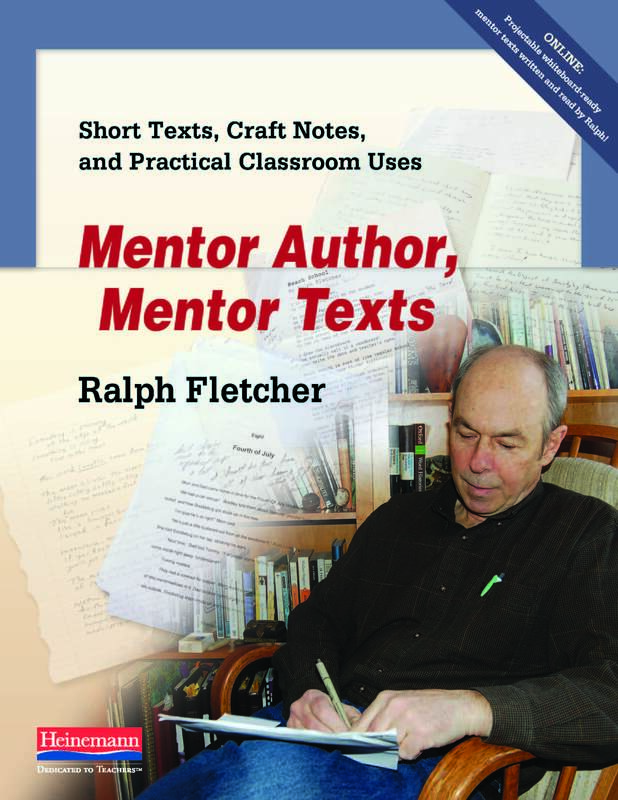 One of the books I’m considering is Ralph Fletcher’s Mentor Author, Mentor Texts: Short Texts, Craft Notes, and Practical Classroom Uses (published in August 2011). I received an exam copy of Mentor Author, Mentor Texts from Heinemann, which I began reading shortly after it arrived on my doorstep. While I haven’t made a final decision about which list to put it on for the course I’m teaching, I must say I think it’s a must-read for the folks who read this blog. It not only provides some of Fletcher’s best thinking on the ways in which to use mentor texts in your classroom, but it includes a goldmine of writing from Fletcher. Each of Fletcher’s texts comes with “Writer’s Notes,” which are explanations about his writing. The Writer’s Notes are the next-best thing to having Fletcher come and talk to your students about his writing! Too often we direct students to “do stuff” with these texts, rather than allow them the choice and time to encounter the texts on their own terms. Read at lease once for pleasure. The mentor texts we learn the most from, the ones that have the biggest impact on our own writing, are the pieces we truly enjoy. Rob is right–rereading is probably the most important way to delve deeper into the inner workings of a text and begin figuring out how the writer put it together. But it’s a balancing act. As soon as we require students to undergo repeated rereadings of a text, we risk squeezing the life out of it. Save texts (or snippets of texts) you especially like, maybe clipping snippets in your writer’s notebook. I appreciated the various ways Fletcher suggests that we can have writers interact with texts. There isn’t just one way to read a book for use as a mentor. In addition, there’s no “right” way to read a mentor text. It’s a very personal thing… we must guide the students in our classes to find the right way (to interact with mentor texts) that they can work with mentor texts. By doing this we encourage students to become independent so they can seek out their own mentors as they move through their life as a writer. Is this mentor piece once I can learn from? What do I love? Or not love? What is the author doing that I have never done in my writing? Why did this writer do this or that? What was his thinking in the decisions he made along the way? What is one part that I admire? Or don’t admire? What seems most surprising here (in terms of how this is written)? If you’re looking for a new book that can help you lift the level of your writing instruction by using mentor texts, then I highly suggest picking up a copy of Mentor Author, Mentor Texts for your professional library. Thank you to Heinemann for agreeing to sponsor a giveaway of one copy of Mentor Author, Mentor Texts. To win a copy of the book please leave a comment about this post, in the comments section of this post by Sunday, October 30th, 2011 at 11:59 p.m. EST. A random drawing will take place on Tuesday, November 1st and the winner’s name will be announced in a blog post later that day. Please be sure to leave a valid e-mail address when you post your comment so I can contact you to obtain your mailing address and have my contact at Heinemann send the book out to you. Please note: Your e-mail address will not be published online. Thank you for writing about this important book. The short writing examples are great and I love the tips for students. I have returned to the classroom after seven years of providing professional development for teachers in using the arts to support learning. Writing was a large focus of my work and what I also bring to my new 4th grade students. What a great book to share with my class. Thanks for the new book to add to my collection. Love you gals!! You amaze me everyday with your thoughtfulness and insight. Ralph Fletcher is another writer I much admire. Would love to get my hands on this book. I already bought a copy, but would love another for a gift. Yes, it’s that good! I am currently working towards my 2nd masters in the teaching of writing and I just used one of R. F.’s poems in that book as an inspiration for one of my own. My professor commented that my poem sounded like something you’d read in a magazine. Thanks, Ralph! I love anything he writes. I bought a copy but want to have one for home! Great suggestions for thinking like a writer as well as a reader. I love the suggestion to encourage students to use a pencil or highlighter to find examples of what they deem significant as the author’s craft. Ralph Fletcher is right on the money! Would love a copy of this book!! Thanks for sharing Ralp Fletcher’s new book. I find “pearls” in all of Ralph’s work and look forward to delving deeper into this one too! What a wonderful opportunity for you, Stacey! And how lucky for your students! I look forward to hearing more about your class. Heard Ralph Fletcher this summer at TC – so glad he keeps writing more books. I’m a big fan of Rah from way back. His writing advice is always thohtful and spot-on. I’m glad to know he released this book … It’s now on my “to read” list! This truly resonated with me because over the years I have learned to do exactly this- use a favorite read aloud as a mentor text not only for reading but for writing as well. I start the year with it (A Long Way From Chicago) and we use it to explore author’s craft throughout the year. I love it and the kids love it so we remember it more – and the learning sticks. I just discovered your site today and love it! I also love Ralph Fletcher, but don’t have his new book yet. I agree about the importance of reading a book the first time for pleasure. We really need to enjoy it completely before thinking about the writer’s craft. I think the writer would want it that way! I’ve loved Ralph Fletcher for a long time – using his as mentor texts – especially Twilight Comes Twice. Somehow though, I’ve only recently discovered him as such a wealth of professional inspiration. Unfortunately, I’ve had to use borrowed copies of his work so I would LOVE, LOVE to be inspired by my own copy of this new work to mark up as use as my ‘go-to’ for my own learning! I love this blog. I am always looking for good teacher books to read to improve my teaching. I’d love to win this fantastic book!! I constantly refer to Ralph Fletcher’s books to guide Writer’s Workshop. His new book looks fantastic and would really complement WW lessons! I love Ralph Fletcher, his books inspire me and challenge me to be a better teacher. I can’t wait to read this book! This looks like a fabulous book …like all of Ralph’s books! I would love to be able to teach with it! Repeating texts more often is so important, and something I struggle with in my over-scheduled day. This insight sounds like welcome advice. I love your blog! I have been doing Writers Workshop for three years and believe in its power to encourage students! Thanks for helping me stay current with my lessons! I have Mentor Texts and am anxious to read the newest book. Good luck with your new position. Your students will be well prepared with your instruction! I love Ralph Fletcher….and was lucky enough to hear him speak at a conference here in Vermont. I refer to his books all the time even though I have been teaching for 25 years. This sounds like a necessary reference for teachers of writing. I don’t think you can ever go wrong with Ralph. I would love to read this book. I love Ralph Fletcher’s work. I love the idea of having the student’s reading first for pleasure and understanding and then again for the actual craft in the writng. Discussion is so important. I work in an inner city school and I am really working on these concepts which my students don’t readily embrace. When they do appreciate exceptional writing it feels wonderful. Thanks for highlighting Ralph’s work. Ralph Fletcher has been my guru for many years. I always am interested in his insights into writing. I have spent my weekend making plans for introducing writer’s notebooks this week. Ralph Fletcher’s previous books played a big role in my planning. I NEED his new book! Every year I read Fig Pudding as one of my first Read Alouds, so that I can then use it as a mentor/teaching text for our first units in both writing and reading. My class always falls in love with Fletcher as an author. I also love what Fletcher has taught me about teaching writing, and would love to continue learning from him through this book! Can’t wait to try it out. I’m always searching for inspiration as I teach 44 fourth graders writing. Ralph’ s advice has been good in the past. Ralph Fletcher has changed the world of writing in classrooms. His books such as Twilight Comes Twice is a wonderful model to students. His professional books and picture books should be a staple in every classroom. I LOVE this! I teach in a small rural school where the students have had limited life experiences. This method/strategy would allow me to introduce these students to a wider world than they already know and they would get to write about it too. I am a book hoarder (not that I keep it for myself, I aready share my books freely). I love to share snippets of the books that I read with my students. My enthuisiam definitely makes a huge difference in their desire to read. Now I want them to WANT to write like the books they read! I’m a teacher librarian in a high school of 2,000 students north of Seattle. I’ve been collaborating with our reading teacher to work with her struggling reader classes to learn reading strategies to understand different types of texts. We are now creating a word wall of all the terms they locate they don’t know or are unsure of. This week they will be collecting information about the character traits of the main characters in their books, and we’ll be comparing and contrasting the traits of their character with a classmate’s character. They will be prioritizing which traits are most important for this character in regard to being successful in the book. We are seeing the students become totally excited about “words” and now the ticket in the door for class is a new “word” they found they didn’t know the meaning of. This book would be a wonderful resource for us to use to enrich our curriculum with these classes! Thanks for your great posts! I just saw this book yesterday and wanted to research more about it before purchasing. I’d love to win a copy! I use mentor texts with my fifth grade students daily. I agree with Ralph Fletcher that the first reading needs to be for enjoyment. During the second or third readings, my students begin to notice things I never did. I was glad to be reminded of the fact that books bring the simplest of pleasures to kids (and adults, for that matter.). I am guilty of bringing books to that class to teach a “lesson”. Sometimes my “lesson” is not what the child finds fasinating about the text. I will try to give more options about what the students find useful about the text and then see how they apply it to their own writing! So excited about using this book to teach! I have just started teaching English again after several years of teaching only reading. I am finding Ralph Fletcher’s texts to be extremely helpful in my professional as well as writing workshop growth. Thanks for this post! I really like his alternative approaches to getting students to engage with a text, to read a text like a writer. I especially like the one about taking excerpts and pasting them in a writer’s notebook of some sort. This book definitely seems like a valuable one to aid in my teaching of writing. This book looks interesting. I would love to use it with my kids. I love using Ralph Fletcher’s ideas in both my reading & writing workshops. I love to see the excitement in children as they get turned onto great text and when they see themselves as authors! Sounds like this is another must read! Ralph is wonderful…always someone we can learn from, and always very applicable approaches. Thanks, Ralph! Fletcher is a great author, so I take his advice about writing seriously. And, it works with students! I have to say, rereading your notes reminded me of how I use to teach writing; how I try to teach writing at times and how I SHOULD teach writing. I need to rememeber to stop and take time. Sometimes in the teaching world we get so caught up with all that is on our plates that we dabble in a little bit of each instead of throughly enjoying one piece! Thank you for the reminder! I love Ralph Fletcher! I have use his Craft Lessons with first and third graders with great results. This book about mentor texts looks like one I need to have as well. Ralph Fletcher is a master teacher, writer, and mentor for writing teachers at all levels. I can’t wait to read his new book! Ralph Fletcher is a master teacher, writer, and mentor for writing teachers at all levels. I love his children’s literature, professional texts and conferencing videos! I can’t wait to read Mentor Author, Mentor Texts! I would suggest Mentor Texts (Dorfman and Cappelli) for your graduate course and also Craft Lessons (Fletcher and Portalupi). As you probably know, both titles also have a nonfiction counterpart. Love Dorfman and Cappelli’s books on Mentor Texts and Nonfiction Mentor Texts, as well as both of the Craft Lessons books. They’re all wonderful resources that I’m considering. I would love to add this book to my collection! Ralph Fletcher’s books have helped me immensely as a writing teacher! I am intrigued by this resource and hope to read it soon. Only today have I begun considering mentor texts, and I have several questions on its implementation that it seems this book may answer. Therefore, as I continue developing my understanding on mentor texts, I hope to refer to this resource, and seeing from all of these comments, it seems like Fletcher is an incredible thinker. All of Fletcher’s books are a must for any writing teacher. I have used Cynthia Rylant’s books for several years as mentor texts. My students are currently using Patricia Polacco books as a springboard for writing. I love the statement about how when we “require” a particular reading, we can squeeze the life out of it. This sounds like another good text to give me the inspiration to delve deeper into mentor texts and enrich my students’ writing experience. I have been looking forward to this book for some time! I am always looking for ways to help teachers use mentor texts in the classroom. I look forward to the reminders of the dos and don’ts – especially to experience the book as a reader first! I’m a teacher working in one of the largest schools in NYC. We are studying different mentor authors and would love to read Fletcher’s book to further learn how to use mentor authors in my classroom. I am a big fan of Ralph Fletcher. I saw this new book at the conference but haven’t ordered it yet. I have yet to meet a book by Ralph Fletcher that I didn’t like. Ralph Fletcher is a genius to me. The way he explains how to teach makes me excited to learn right along with my students as we all write. I use tons of Ralph Fletcher for writing anyway. This book sounds like a must have for me and my students. Thanks for sharing it. My fingers are crossed for randomly getting picked out of all these other people:) If I don’t win, I’ll for sure have to buy it! You can’t go wrong with a book by Ralph Fletcher! I am always looking for mentor texts to teach writing. New thinking about the use of mentor texts will certainly be helpful. Reading and rereading gets students into a habit of rereading and thinking…less of I’m done, what’s next? But I still blanch at the idea of marking directly with pencils in books. But increasing the interaction is essential. Perhaps I’ll try marking up machine copies of text, or transcribed copies… Want to think this through. After reading the comments I will definitely add this book to the professional collection at my school. Thanks so much for bringing it to my attention. We use Ralph Fletcher as our writing curriculum….he has a way of helping children really focus in on the art of writing. I’ve had his new book on my wish list since it came out. I would love a copy…thank you for this giveaway. This book has been on my “buy soon” list since Heinemann first sent out notice. How can teachers NOT combine writing/reading when talking about author’s craft and encouraging young writers? I’m always on the lookout for more examples to share with my students. This book promises to be another good one from a trusted source! any book by Ralph Fletcher is a book for me to read! This book seems awesome. I look forward to reading it. I must agree that we sometimes squeeze all the enjoyment out of books by trying to do so much with them. letcher has changed the teaching of writing. What a great resource about mentor texts! I would love to have a copy to read and share with my colleagues! I use Ralph Fletcher mentor texts so often that my students lovingly refer to him as “Ralph”! I can’t wait to get my hands on this new read and share it with my writers! LOVE his books — actually, they are one of the few ones I use regularly, but I use MANY. He taught me how to use Writer’s Notebooks the right way. Would LOVE to see what this one would add to my teaching. I look forward to reading it. Ralph Fletcher is THE guru of writing. Congrats Stacey on the new position. Your students will receive a great experience. I’ve been changing the way I introduce mentor text and how the children will experience it. Especially returning back to a text. This book seems to hold some ideas! I have to create a list of mentor texts for a class that come from my libray and Ralph Fletcher’s book would be a great resource for me and my teachers to have! I have used Craft Lessons for fiction and non-fiction, and just purchased Pyrotechnics on the Page. This new book sounds like another great resource for the classroom. Thanks for sharing. I can’t wait to read this book! Have you read Cracking Open the Author’s Craft by Lester Laminack? Like Fletcher, Laminack uses his own writing to teach intentional use of writer’s craft. It comes with a DVD of Lester reading his book and teaching mentor text lessons. Definitely another “must-have” for mentor text teaching! This book looks like a great resource. I’d love to use it in my class overseas. Ralph Fletcher is always a go to person when I am working on writing with my students. Can’t wait to read his new book, and how nice it would be to add this book to my collection right away to be used with my students! I just bought one of Ralph Fletcher’s books this afternoon. I find his work inspiring. This is the first year we’ve done writer’s workshop and I need all the support I can get. Ralph Fletcher is such an amazing writer. I love the books he writes for teachers and the ones for kids. Flying Solo is a read aloud I’ve used in the past, and Writing Workshop was one of the first writing books I ever read when I began teaching! I recommend it to every new teacher I come into contact with! Wow! What a wonderful resource from a wonderful mentor. Ralph Fletcher has inspired not only my students to be better writers, but this teacher as well. Whether the give away is in my favor or not, I will be getting this book for my classroom. Thanks for sharing such great resources with us and for giving us the opportunity to obtain the those same books for free! Ralph Fletcher is one of my mentor authors – he’s helped me hone my teaching for Writer’s Workshop. I am interested in all he writes! I love Ralph Fletcher and his work. This book will be a great addition to my collection. His work has helped me become a better teacher to my fifth graders. Can’t wait to read the new book. I’m a huge Fletcher fan! I often search for mentor texts to use to immerse kids in the genre before writing and would love to have this as a resource for more ideas. The kids and I already use some of Fletcher’s books for writing (How to Write Your Own Life Story and Live Writing). If you chose it for your writing class, I’m sure it would be a book that doesn’t get sold back to the book store at the end of the session. Good luck. How exciting to have another resource regarding mentor texts. Writing is our school-wide focus currently. I learned so much from Ralph Fletcher to share with my students. I love his children’s books. I look forward to reading this book and learning more. Looks like another great resource from Fletcher! The snippets you shared were valuable tokens to quickly consider when encouraging students’ selection and use of mentor texts. Thanks for your contributions to this blog . . . always helpful, thought-provoking, and insightful! Thank you for this post. You included lots of ways to help cultivate a love of books for so many reasons. This book is an excellent resource I can’t wait to read! Thank you for your blog – I love following it via Facebook. Love Fletcher’s work and look forward to checking out his new book. Thank you for brining it to my attention! I spent my summer thinking deeply and reading about how I can help my students develop as writers, Don’t know how I missed this book. Thanks again for all of the great ideas I glean from your writing. Having met and enjoyed a workshop session with Mr. Fletcher, I am excited about adding his new book to my collection. I use mentor texts to teach writing in my first grade class and can’t wait to add to my collection of resources. Thank you for the post. I will use the questions from Fletcher’s introduction with my students. Love these! This book looks like a great resource. Ralph Fletcher’s writing advice is always valuable and inspiring for teachers. I would recommend his books to any teacher. This one sounds really helpful, and I can’t wait to check it out. I too like the various ways that are offered that my students can interact with the text. Teaching writing is my hardest subject to teach. I am excited to see what the Fletcher book had to offer. First, Ralph is one of the most engaging speakers and writers I have ever had the pleasure to hear/read. One of the things that was mentioned above that I completely agree with is that writers (young and old) have processes that are completely unique to them and we need to honor their decision making and choices about how to approach the process while still helping them to grow as writers. This is NO easy task. I think that remembering all of this and doing our best to teach this way can be difficult when we are so invested in their writing development. This is part of the process vs product problem. I am not familiar with Fletcher, but am now eager to learn more. I am busy with a reading endorsement class, and I am learning a tremendous amount of useful tools for integrating and improving reading and writing with research based techniques. Fletcher’s work fits right into what I am doing. This is an exciting resource for me to learn about! This resource looks excellent! I would love a copy. After spending time with Kelley Gallagher and Jeff Anderson this summer I am reminded of the importance of mentor text. I would love to have a copy of the book to help me improve my use of them in the classroom!!! First of all, I love reading this blog every week! I have gotten so much encouragement and so many ideas from it. Thank you so much!, Secondly, this books sounds like a gem. I have mentor texts in my classroom, but I feel I don’t use them as much as I could. What a great resource! Can’t wait to get this book for our Writing Project site! One of our teacher consultants did a great summer institute workshop on mentor texts. She talked about her ” friend,” Ralph Fletcher, and held up a 10″ picture of him affixed to a body-shaped cardboard cutout every time she referred to Fletcher or his work. by the end of her session, Fletcher was my friend as well! I saw Ralph Fletcher in Savannah, Georgia last year and he totally inspired me. Using mentor texts is the key to getting students excited about writing. I plan on reading this next book of his and incorporating his ideas for using mentor texts. This is exactly what I have been looking for! I am trying to rally my students to push themselves farther in their writing and mentor texts are my window to writing for them. Yes, please! I would love a copy of his new book! I appreciate the fact that the message of the book is valued first before applying a strategy. Love of reading should always be our first goal. Woot, woot! Ralph Fletcher’s ideas speak the magic word of d.i.f.f.e.r.e.n.t.i.a.t.i.o.n. and I am loving it! I love how his mind works. i want want want. I have his How to write your life story and the writer’s notebook. I can’t wait to read this book! I love Ralph Fletcher. My young writer’s know his name as I talk about him all the time. I love using Mentor Texts in the classroom for writing. I learn along with my students! I hope Fletcher lists some of his favorite Mentor Texts – some of the ones others suggest end up becoming my favorites. I’ve recently started a writing club at my middle school. I’ll be sharing mentor texts with them next time we meet! I am an avid reader of Ralph Fletcher books! His books are the cornerstone of my writing class. We just completed How to Write Your Life Story…my students loved it and we gathered wonderful ideas in our writer’s notebooks! I would love to add this book to our collection! I have heard many great things about Ralph Fletcher. Unfortunately, I have not had the pleasure of reading anything just yet. I have always used mentor texts in my classroom but this post has caused me to rethink how I use them. I am looking forward to reading this book. I would like to win a copy. I’m looking forward to reading this book. I’m glad to see he mentions the importance of loving the book you choose to use as your mentor text- I always find that my lessons go the best when I’m using a book I genuinely love to model from. I would love this as I can always use more support on how to support my students in using mentor texts. Thank you for this great giveaway. Spent much of yesterday admiring and appreciating the work of Ralph Fletcher during a writing seminar with colleagues, as we worked on ways to help our students meet the Common Core. I’d be grateful to win a copy! I love the idea of having students read a text once for content and again for author’s craft. Looking forward to using this book! Ralph Fletcher is one of my favorites!! His passion for writing and teaching our students to write resonates through everything he does. I use quite a few of his books in my teaching. Numerous quotes of his have been glued into my student’s writers notebooks. This book will certainly find a way into my library. I look forward to the books you decide to use with your class. Have I ever been disappointed by anything Ralph Fletcher has written? NO! This looks to be a very useful text. Mentor texts are so important, but teachers I work with often have never developed that bond with the books. I love when great resources are recommended! I love Ralph Fletcher! I’m always using his works in my classroom- A Writers Notebook, How to Write Your Life Story, Craft Lessons. When I went to the Teachers College Writing Institute this July, I was bummed to learn that he was going to be at the August sessions. Would have loved to meet him! As soon as I read what his new book is all about, I knew it was going on my Must-Have list of books to read. Too often with our time restrictions we look to have too little time to remember that you need to read something for pleasure and not analyze it at the first reading. If this book is anything like Ralph’s other books we will be thrilled. His ideas always seem practical and user friendly for teachers. This may be a great book club pick for teacher study groups. Love Ralph Fletcher for my personal writing growth and helping my class’ writing. I’m anxious to read this new book! I love introducing my students to the power of picture books. Would love a copy of this book. Everything Fletcher writes is a must have! I use Ralph’s books throughout the year! His writing is engaging and some of his books (A Writer’s Notebook, Live Writing) are very kid friendly, so I read them aloud. I look forward to reading his latest. Ralph Fletcher makes me jealous. He writes so well across so many different genres. It just isn’t fair. I look forward to reading this new book. I strongly believe that the more choice we give our students the more engaged they are in their learning. It’s been on my wish list too! Fletcher’s new book sounds wonderful. I love the questions that he has written for the students to answer. I agree that we (teachers) are often proposing so many new ideas to the students rather than offering more choices to our students. Fletcher says it best when he says “Too often we direct students to “do stuff” with these texts, rather than allow them the choice and time to encounter the texts on their own terms.” Our choice might just be our teaching while “their choice” will be “their learning”. I can’t wait to have the opportunity to read this next book of his! I would love to add this book to my professional library! I teach middle school and love the idea of “approaches” to mentor texts, and allowing my students to choose their favorites. Please enter me in the drawing. Does it disqualify me if I pre-purchased a copy because I am such a die-hard Ralph Fletcher fan? I even had my picture taken with him at our state conference when I tried to talk to him, but got totally flustered because I was in the presence of greatness! I would still love a copy to share with a colleague. I really enjoy using mentor texts to teach writing. This sounds like a great resource. Thanks for posting about this! Thank you so much for the great giveaway. I have learned so much from your blog and book, and totally trust that this book is a must read. I would love a copy of this book to read and share with my colleagues! I wish I could hear Ralph Fletcher in person! That is exciting that you are going to teach an adjunct course. It sounds like it will be so much fun since the content is closely aligned to your interests. Whoever wins Fletcher’s book is lucky! I’d love to win a copy of this book! I actually put it in my cart on Amazon prior to reading this post. A group of teachers I work with is studying another Fletcher text, Writing Workshop: The Essential Guide. This would be a great addition for us to share! I definitely will. I will be blogging more about it as I plan the course (and once I teach it). Ralph Fletche is an amazing mentor and wealth of information and inspiration. I would love to hearore about your graduate course and he texts you decide to use. Katie Wood Ray’s Wondrous Words is a great text as well! Sounds like this is a book I should be buying. I haven’t done as much with mentor texts with my high school students as I should. This should give me the motivation to start up again! I love Ralph Fletcher as well. It only makes sense to consider the use of mentor texts as we use them as “real” writers do. Kids need to learn skills the way we do in “real” life! I love how Ralph Fletcher thinks about teaching writing. His manner is so natural. I see my first graders use mentor texts in just this way all the time. The dive in and read a book for enjoyment and then they look back at it carefully to try to emulate the style. Right now we have many versions of early graphic novels in the style of Elephant and Piggie being written in our room. They love that format — especially the conversation bubbles. Sounds like a must-have text! Would love to read it and use it. Great giveaway! I was just talking to a teacher today about the importance of providing mentor texts during writing workshop. I can’t wait to read this book and put it to good use. 🙂 Thanks for bringing this to our attention. OHHHH this book is on my Amazon wish list! I hope I can wait until the 1st to see if I win! lol I’ll have it in my cart just in case! Thanks for the chance. Oops, just bought it! It is wonderful, like all of Fletcher’s books. I’ll be interested in what other books you choose, too, Stacey. It sounds like an exciting experience. I got this book as soon as it came out. Unfortunately, it is still in my pile of books to read. Sounds like I need to dust it off and start reading it soon; I’ve never been disappointed by any of Ralph Fletcher’s books. I’ve been sorting through many of my mentor texts as I move on toward December …. teachers are delighted to adopt some of my favorites! I mean, really, there’s only so much room in the storage area. However…I would love a copy of Fletcher’s book to devour and pass on to excited friends. I could really use this book in my classroom! I have ready enjoyed this blog. This book sounds like it will be a great resource for teaching kids how to read like a writer. Teaching students that authors are purposeful about the decisions they make as writers is essential. Once students start noticing authors’ craft and are engaged in discussion of authors’ decisions about craft they start to be more purposeful about their own writing. I love Ralph Fletcher’s resources for teaching writing and I’m sure this new book will not disappoint me! A number of Fletcher books were a part of my summer reading pile. I’ve heard of this new book and read some reviews. It sounds like a jewel! So often our reading and writing instruction are separate, or at lest only coupled by the “response to text” writing we all do to prepare for testing. It seems to make sense to use your own modeling, and modeling of experts through mentor texts to help our students grow as writers. I love Ralph Fletcher and use his materials and ideas all the time. I especially love Twilight Comes Twice and his books for young writers. Mentor Author and Mentor Texts sounds like the ideal textbook for your class. I hope you require your students to read and reread those mentor texts as well as develop their own personal library from which to pull ideas for their future writing (and reading) students.